This article is about the railroad or tram crew member. For the power system often called the "conductor rail", see Third rail. A conductor (American and Canadian English) or guard (Commonwealth English) is a train crew member responsible for operational and safety duties that do not involve actual operation of the train. The conductor title is most common in North American railway operations, but the role is common worldwide under various job titles. In Commonwealth English, a conductor is also known as guard or train manager. Some rapid transit systems employ conductors to make announcements and open and close doors—as opposed to a train operator performing those duties. The conductor often stays in the center of the train where they can best view the platform. While advances in automation allow most transit systems to use one person train operation (OPTO), a few, such as the New York City Subway, Toronto Transit Commission and Sydney Trains continue to employ conductors. Conductor is also a crew member in some bus, trolleybus or tram operations. In North America, the conductor manages a freight, passenger, or other type of train, and directly supervises the train crew, which can include a brakeman, flagman, ticket collector, assistant conductor, and on board service personnel. All crew members work under the conductor. The conductor, engineer, and additional engine crew members (fireman, pilot engineer) share responsibility for safe and efficient train operation and adherence to railway rules and procedures. On some railroads, union contracts specify that conductors must progress to engineer. Communicate and coordinate with other parties—yardmasters, trainmasters, dispatchers, on board service personnel, etc. As there is no explicit Federal requirement for a two-person train crew in the United States, the Utah Transit Authority originally planned their FrontRunner service to be operated by an operator only, with revenue collected by a proof-of-payment system. Before operation began, the FRA required FrontRunner to employ a second crewmember on each train to assist with emergency evacuation, disabled access, and other safety-sensitive situations. FrontRunner classified this job as a train host, with a focus on customer service rather than railroad operations. 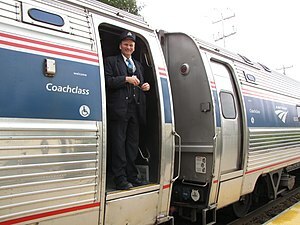 Some other services, such as Amtrak's Downeaster, also use train hosts (paid or volunteer) to assist the conductor with non-revenue-related customer service duties. In the UK, Australia and New Zealand, the person with ultimate responsibility for operation of a train is usually called the guard, a term that derives from stagecoach days. Until the latter part of the 20th century, guards on passenger trains in these countries did not have routine responsibilities for ticket inspection or sale. Their jobs focused more on safe operation of their trains, timekeeping, handling parcels, and other consignments. A dedicated 'travelling ticket inspector' handled fare duties. In recent years, passenger train guards have been assigned more responsibility for on-train revenue collection and ticket inspection. As well as ticketing and customer care, guards must be trained in "emergency protection" duties, should an emergency arise, along with other operational roles. This involves using emergency kit such as detonators, track circuit clips and flags to prevent other trains colliding with, for example a derailed train. If in a crash the driver became incapacitated, the guard is the only person left who can protect the train. Other day-to-day duties include operating the public address system and train doors. Under British Railways, there were several grades of guard, depending on whether the guard worked on freight or passenger trains—and a purely operational guard grade worked freight and passenger trains without customer contact. When the guard has significant customer contact, the position is usually classified as conductor-guard or conductor. Since British Rail, there have been a number of titles for a guard's grade but, with a few exceptions, all now perform some sort of customer-facing role. On long-distance expresses, the conductor's title is sometimes enhanced to senior conductor, in line with the implied prestige of operating these trains. Historically, under British Rail, long distance intercity trains were normally worked by the most senior guards at the depot, hence the name senior conductor. Several more recent private UK passenger train operators have further renamed the senior conductor's passenger facing title to "train manager". In the UK, technological improvements and economic pressure have made some trains lose their guards and become driver-only operated (DOO). British Rail first brought this in on some commuter services in London and Glasgow, as well as on almost all non-passenger trains. In 2003, a controversial amendment to the UK operational rule book moved part of the guard's safety and operational role to the driver. With rail service privatisation, train operating companies (TOC) attempted to bring in DOO to other network areas—c2c operating from London Fenchurch Street is an example of this. Currently, several titles describe a guard: train manager, train host, conductor, and South West Trains and Merseyrail still use the term guard. The role of the guard is set out by a mixture of the Railway Rule Book and train operating companies. In Australia, there is today a mixture of driver-only operated trains and trains with a guard depending largely on state-based railway legislation. All passenger trains in New South Wales operate with a driver and guard. Guards were removed from freight trains in the 1980s, but these still operate with a two-man locomotive crew. Sydney Trains—which operates all metropolitan trains—and NSW TrainLink intercity trains have a train guard. The guard is ultimately responsible for the safety of all passengers on the train. They control the operation of doors and Public Address, perform platform duties, provide basic customer service, operate the train to timetable and accept and deliver internal mail. On Sydney Trains, the guard is normally located in the middle of the train, but on the newer Waratah trains, and on NSW TrainLink intercity services they normally work from the rear. The guard is not responsible for inspecting tickets - this role is performed by Transport Officers and NSW Police. On NSW TrainLink regional Xplorer and XPT services the train guard is known as a Passenger Service Supervisor (PSS). While still responsible for the safety of passengers, the PSS is also in charge of delivering customer service and a number of value-add functions on the train including ticket inspections and manning the cafe alongside Passenger Attendants. On Xplorer trains, the driver operates the doors when the PSS gives clearance to depart. On XPT trains, the PSS performs the platform duties of a guard in conjunction with the driver. Passenger trains are operated by Queensland Rail, and all operate with both driver and guard for suburban passenger services, or Passenger Services Supervisor for long distance passenger services. Trains in metropolitan Melbourne have been driver-only since the early 1990s. When the city's rail franchise was offered to the current operator, Metro Trains Melbourne, a proposal existed to reinstate guards on some peak train services, however this option was spurned in favour of hiring additional platform staff. Regional trains operated by V/Line are operated by a driver and conductor. The conductor performs platform duties and—on locomotive-hauled trains—operates the train doors. They are responsible for passenger safety and also perform ticket inspection duties. Adelaide Metro's metropolitan rail network is configured for driver-only operation, but also operate with Passenger Service Assistants (PSA). This is safety role, but with a focus on customer service and revenue protection. Normally, the train driver operates the doors, but PSAs are also able to. Transperth trains are all driver-only operated. In New Zealand, inner-city commuter rail networks are staffed by a driver and a train manager (guard) as a minimum. In Wellington, where ticketing is still paper-based, each train has between one and three passenger operators (ticket collectors). The exact number of passenger operators depends on how many multiple units or carriages make up the train. In Auckland, off-board ticketing and smartcard systems have reduced the staff level to driver and train manager only. Auckland train managers are now not responsible for revenue on trains, as Revenue Protection officers carry out these roles. In general, conductors in Switzerland collect or punch tickets, fine people the first charge of 100 CHF for not having a valid fare, and make announcements on the public address system. They also may fine passengers if they take a longer trip than normal. For example, if one takes a train to Bern via Biel, having departed from Geneva, which is a longer trip than taking the InterCity via Lausanne, the conductor can fine the passenger a supplementary fare. They sound a warning when the train's doors are going to close. Many conductors, especially those on night shift and on isolated regional lines, are being trained in self-defence against would-be assailants. In Belgium and The Netherlands, train conductors have multiple tasks involving train safety and customer services. Belgian/Dutch train conductors are responsible for the departure of the train. In each station they give the permission to move on by giving a ready signal to the train driver. Therefore, train conductors in Belgium and The Netherlands always close (and in some scenarios also open) the doors. They are also responsible for performing safety tasks in case of an emergency or accident, such as fire, evacuation, etc. Because of these tasks, there has to be at least one conductor on each passenger train; a train without a conductor is uncommon, but still appears on some regional Dutch trains. The departure trains always have one conductor who is conductor-in-chief. He is responsible for the entire train, the on-board crew and the passengers. Some longer trains may have additional conductors who are under command of the conductor-in-chief. Besides the safety tasks, conductors also collect and punch tickets, fine people for not having a valid fare and make announcements to the passengers. In Hungary a conductor may assist the train driver in testing the train's air brakes, and sometimes they have to lead the shunting, mostly when the trains are switching lines. Hungarian train conductors are responsible for the departure of the trains. In each station they give the permission to move on by giving a ready signal to the train driver. During the day they use a disc (which is white and has a green border) to give the ready signal to the train driver. After sunset they give signals with flashlights. Train drivers are not allowed to move the train without the conductor in chief giving them the ready signal. Conductors, along with train drivers, are responsible for keeping the trains on schedule. There is always at least one conductor in chief on passenger trains in Hungary. No passenger trains may depart without one, as only they have the right to give the departure signal. After all passengers have left or entered the train and the departure time has arrived, the conductor in chief asks the other conductor for his ready signal. If it is safe to depart he gives a ready signal to the conductor in chief who then gives the same signal to the train driver. As in Belgium and in the Netherlands conductors also collect and punch tickets, fine people for not having a valid fare and make announcements to the passengers. They also sell tickets on the trains; if the passengers have entered the train at a station where a ticket office is operating they can buy a ticket only with payment of a fine. However, if the passengers got on at a station or stop where they didn't have an option to buy a ticket, they can buy from the conductor without having to pay a fine. A female guard on an Indian Railways passenger train. In India, guards are posted on all passenger trains and goods trains and no passenger-carrying train is allowed to move without a guard. The passenger train guard, generally called a mail guard, is completely responsible for the train, its schedule, and safety of passengers and the locomotive pilot. These guards wear a specific uniform (generally white). During the day, the guard uses the traditional green flag to signal the pilot to depart, and the red flag to stop, assisted by two-way radios. After sunset, the guard uses lamp signals in place of the flags. A couple of minutes before signalling departure to the pilot, the guard blows a whistle to warn passengers to board the train. After ensuring all passengers are safe to travel, the guard signals the green flag by waving it from the brake van. In an emergency, the guard uses the red flag to indicate a stop, and may directly apply brakes to stop the train. The pilot is not allowed to move the train without a signal from the guard, as the guard is in charge of the train. Passenger guards also accept heavy parcels and luggage boxes that passengers cannot carry in coaches. Some perishable goods like vegetables and milk are also transported under the guard's supervision, and he is responsible for their proper loading and unloading. Keeping the passenger train on-schedule is an important guard function. Guards carry a first aid box with their belongings, along with other important items, all in a medium-sized duty box (generally painted red). The name, designation and base location of the Guard are printed in white on the box. A designated passenger train, halting at all stations, carries a large heavy cast iron cash safe in the guard's brake van, where cash receipts from ticket sales is deposited in a leather pouch by the station manager (earlier called the station master). Since the late 1990s, all guards are provided with two-way radios so that they can communicate with the locomotive pilot, and other trains if required. The radio has not yet replaced the traditional red and green flags. Modern vehicle design and ticketing arrangements have largely eliminated the need for conductors on street railways and light rail systems. In recent years a number of modern tram or light rail systems have introduced (or re-introduced) conductors to minimise fare evasion and to provide customer care, supervision and security functions, even in situations where a second crew member is not strictly needed. William P. Daniels (ed. ), Proceedings of the Grand Division of the Order of Railway Conductors (Formerly Conductors' Brotherhood): From Organization to the Eighteenth Session, Inclusive, 1868-1885. Cedar Rapids, IA: Standard Co. for the Order of Railway Conductors, 1888. Train Conductor Headquarters - Resource for Train Conductor Training and Requirements. Comprehensive railroad industry information. Wikimedia Commons has media related to Railway conductors.